PSYCH, the hit original series starring James Roday, Dulé Hill, Corbin Bernsen, Timothy Omundson, Maggie Lawson and Kirsten Nelson, returns with its fifth season continuation on USA Network, tomorrow, Wednesday, November 10 at 10/9c. In the season premiere “Extradition II,” Shawn and Gus return to Vancouver to visit their old nemesis Despereaux (returning guest star Cary Elwes) in prison at the felon’s request, who then uses them to escape and pull one last job before he is extradited to the United States. Only while he is out, he is framed for the murder of a Crown Attorney and now asks the guys’ for help clearing his name of this most recent – and frankly unseemly – charge. James and Dulé took some time out to discuss the new season. On December 1, you have an episode paying homage to Twin Peaks. What can you tell me about it? James Roday: Well I can tell you that it is probably the most proud I have been of any of our achievements on the show, which as you know have been plentiful. It’s me basically being a fanboy. “Twin Peaks” was my favorite show of all time. And, you know, to be able to work with seven of the original cast and basically pretend like I was in an episode of “Twin Peaks” was unbelievable. In addition to that, and I think it’s just something that Dule and the rest of the cast all got to enjoy as well, we discovered that several of the original cast members hadn’t seen each other in 15 or even 20 years. So we were basically doing a “Twin Peaks” reunion within our “Twin Peaks” show. And watching them sort of reconnect and reminisce was pretty special as well. So it was sort of like two unbelievable experiences for the price of one. What’s the best thing about working with the other. Dule Hill: Well I would say from my side the best thing about working with Roday would be I guess the challenge of working outside the box. That would be it for me. I mean he’s such a talented actor that his mind will go anywhere and sometimes keeping up and staying on the train is a challenge for me but I enjoy it. You know, it’s a muscle that I haven’t really used in previous parts of my careers. So I’m definitely enjoying the time right now. James Roday: That’s it? That’s all you’ve got? Dule Hill: Yes, that’s all I’ve got man. That’s it. That’s all I got. James Roday: That’s very nice actually. Thank you. Well I would say that in addition to, you know, the obvious which is that Dule is a very gifted actor as well and that he actually makes my job easier by keeping us on the tracks so that I can do all my crazy stuff. I mean that’s sort of what makes the show work and that’s why our chemistry has been so good from the beginning. It’s sort of a – pieces just really fell into place nicely and we’re very lucky. But also he also says everything that we’re both thinking that have nothing to do with acting whether it’s weather-related or food-related or trailer-related or anything you can think of, you know, we’re always thinking the same thing but then he always says is out loud and then I don’t have to which is awesome. You’ve done so many pop culture references on the show. If there was one pop culture reference that has not been done yet that you would love to do, what is it? Dule Hill: Yes. I’m not really a pop – I mean I’m on a show that’s about pop culture references but that’s not really my forte. I’m not really that big into it. Maybe something about Emmanuel Lewis. James Roday: Yes. You know, gosh, I think – I mean there’s still so many areas that are deep and plentiful. I wonder if there’s – if it’s not time that we did like a – I don’t know, like a major sort of Alf reference of some kind. I think he’s probably due for some love. Can you talk a bit about Cary Elwes’ appearance in the season premiere and what he’s like on the set. James Roday: We had a lot of fun with Cary. I think we had more fun with him the second time than we did even the first time because he, you know, he was sort of comfortable in the skin of the character. And he sort of got of better idea of what our set is and that it was going to be all fun and games all the time. And he just came up to sort of goof around this second time. And we spent more time with him off set as well and met his beautiful wife and unbelievably beautiful little girl. And he’s an all-around good guy and very funny in the episode. What other guest stars can we look forward to seeing this season? Dule Hill: Well beyond the Twin Peak-ers which come up, we have Ralph Macchio. He’ll come up – he’ll be in one of the upcoming episodes. We have the return of Ally Sheedy. And then we find out who Mr. Yin is. And then we have Mena Suvari who comes up in that same episode. Who am I forgetting? James Roday: We have Tony Cox. Dule Hill: Oh, yes, Tony Cox came up. That’s right. James Roday: Very funny. Keshia Knight Pulliam, a little Bud/Rudy symmetry there. And Jacob Vargas, very good actor. I think we had a shorter winter season. I think that’s most of the highlights there. Dule Hill: …(Aggie) the Polar Bear. James Roday: (Aggie) the Polar Bear. Are there any characteristics of the characters that you each play that you envy and that you wish you possessed? Dule Hill: I mean I think from my side I do wish I possessed a little more of the – I guess Gus knows a little bit of – he knows something about everything. Like he really has the most random trivia information stacked inside of his brain. And I think for myself I would love to be able to have that kind of information stored up inside my brain. 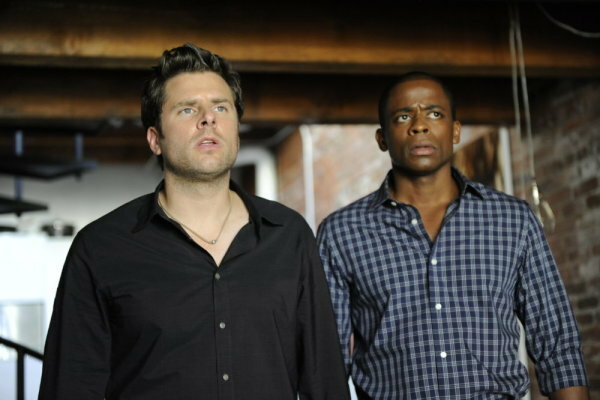 James Roday: I think Shawn sort of represents that person that I don’t know we may have all known or may not that, you know, we always say we wish we could be more like that person because they take so many risks and they sort of live life to its absolute fullest at any given moment and they jump without asking questions. It’s a pretty remarkable quality that some people actually do have. But then we remember that it doesn’t always work out in real life the way it works out on television and that that’s probably why we’re not like that. Are you guys having a Christmas-themed episode and if so, can you tell us anything about it? James Roday: Yes. We are returning to holiday Yule entertainment this season. I actually directed our Christmas episode and I can tell you that it’s pretty out there. It’s our sort of bizarro take on “It’s a Wonderful Life.” Shawn learns what everybody would be doing if he had never come back to Santa Barbara. But it’s – but prepare yourselves because it’s not “It’s a Wonderful Life.” It’s something different and the only thing I can guarantee is that you’ll get to see the characters that you’ve grown to know and love in ways that you never thought you’d see them. Can you tease some of the upcoming episodes and maybe tell us a storyline you haven’t come to yet that you’d want to do? James Roday: …spoken about Christmas. We do have a “Police Academy” episode which features Ralph Macchio who we mentioned. Shawn and Gus have to save a polar bear that may or may not be being framed for murder. We have an episode in a haunted house in an amusement park. James Roday: Probably the closest we will ever come to embodying the cast of “Scooby-Doo.” And then we do – we bring home the Yin-Yang Trilogy. That will be our finale where everything comes out in the wash. Pretty packed, pretty solid winter. As far as – I mean I can tease – I can actually tease that at some point next season we’ll be doing vampires. James Roday: Yes. We can probably work that in there. James Roday: We’ve been talking about a musical forever. That’s up on the board. Baseball has been on the board for awhile. I think it’s probably time to make that happen as well. What do you think makes Shawn and Gus relationship work so well since they are such polar opposites? Dule Hill: I think you just answered it right there. I think they fill each other out. They both bring each other to the center. You know, one is extremely to the right and one is extremely to the left and they balance each other out. I think without their relationship they would both be too far in either direction. I think Shawn would be doing something – I mean Shawn his life would be a long time ago spin out of control and Gus would be a hermit. Going to work, going home. Psych is filled with ‘80s references, so if you could change things up and switch to another decade for a season, which one would you choose and give me some examples of what the episode would cover. James Roday: I second that. Regarding the “Twin Peaks” episode, does David Lynch know you’re doing it? Have you tried to contact him? Dule Hill: He does know we’re doing it. James Roday: My understanding and I’m obviously both titillated and nervous about this is that he is aware of the episode. His dear friend Catherine Coulson, aka “The Log Lady”, came up and did the episode and called and left him a message while she was sitting on our set. So I’m pretty sure that he’s aware and I can only hope that we did him proud. I feel like we did. You know, our whole hearts went into that episode and we had the support of, you know, about half of his cast. So if he doesn’t like it, there’s going to a lot of people in trouble. Do you guys believe in psychics? James Roday: Yes. And sure, I believe in psychics. I don’t believe in all of them. I think some of them are full of it just like Shawn. But I think there’s enough weird stuff out there and unexplainable things that there’s bound to be some people that have senses that most of us don’t have. Dule Hill: I think there’s more Shawn Spencers and less Notradamuses. But either way I’m like don’t tell me. Let me be surprised. WATCH THIS! The Season Premiere of DEXTER!